Coffee output in India is pegged to be a record 3.50 lakh tonnes in the 2017-18 marketing year started this month on higher acreage. According to the Coffee Board, the final output stood lower by 10.34 percent at 3.12 lakh tonnes in 2016-17 marketing year from 3.48 lakh tonnes in the previous year. 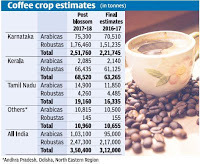 Coffee Board stated that the crop’s forecast for 2017-18 is placed at 3.50 lakh tonnes, comprising 1.03 lakh tonnes of Arabica and 2.47 lakh tonnes of Robusta varieties. Higher output is mainly attributed to the additional bearing area of about 13,500 hectares in traditional growing areas of Karnataka, Kerala and Tamil Nadu.